Create slab-built pieces with textures and patterns created from your own self-made stamps and rollers, as well as inlaid and stencilled colour. Suitable for beginners and those with some experience. (Held at Wellington Potters' Association, 130 Grant Road, Thorndon). Pieces will be made with rich surface texture and pattern using slab-built construction. An array of texturing devices will be created in class (hand rollers, stamps, carved surfaces) and impressed into the clay. This textured clay will then be constructed into your choice of form such as vases, platters, brooches, etc. 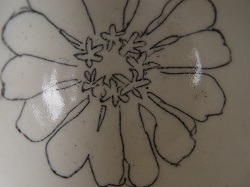 Some of these impressed designs on the pots will become the basis of inlaid designs. 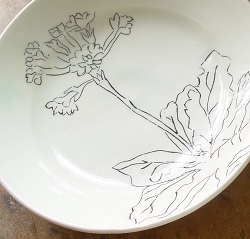 Stencil techniques will also explored on a small scale pieces and pieces glazed for a mid-fire glaze firing. Designs derived may be as subtle or bold. Everything provided, but feel free to bring your own (non-ceramic) inspirational objects: leaves, stones, feathers etc. to use as a jumping-off point for creating patterns, lines, textures. Ideal as a next step for those who have done a beginners’ course but no previous experience is required.